1 owner from new! This beautiful town house is situated within a gated development at Queen Anne's Quay. 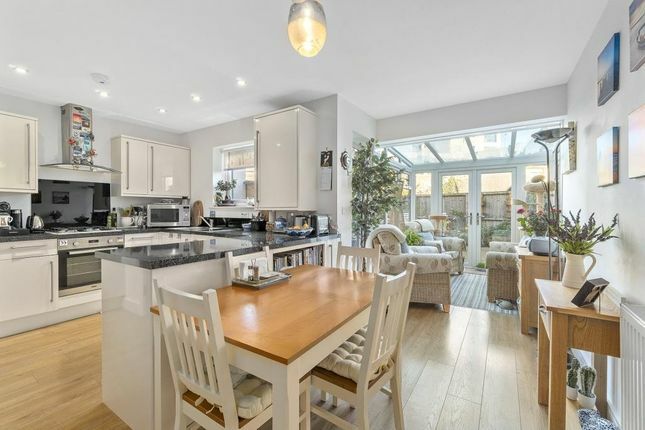 The home is set back from the marina with three double bedrooms and an open plan sociable kitchen dining area that flows into your conservatory. There is a private, enclosed low maintenance garden to the rear which really tops this property off. Entrance Hall Smooth ceiling, ceiling mounted light point, double wall mounted radiator, stairs rising to the first floor. Area for coats and shoes etc. Entry telephone system, door to understairs storage cupboard, doors to the garage, downstairs WC and kitchen. Downstairs WC Smooth ceiling, ceiling mounted light point, extractor, wash hand basin, double wall mounted radiator, low level flush WC. Kitchen/Dining Area16'9" (5.1m) max x 11'8" (3.56m) max.. Kitchen area with smooth ceiling, inset mounted spotlights, range of matching wall and base units, complementary work surface over, one and a half bowl sink with drainer unit and monobloc mixer tap. Integrated four-ring gas hob with oven under, filter hood over. Integrated fridge/freezer and dishwasher. Two large pan drawer, double glazed window to rear aspect. The dining area has smooth ceiling, ceiling mounted light point, double wall mounted radiator, open frame to the conservatory. Conservatory11'3" x 7'9" (3.43m x 2.36m). Glass panels to both side aspects, French doors to the rear opening on to the rear garden. First Floor Landing Smooth ceiling, ceiling mounted light point, doors to the bathroom, lounge and bedroom three/office. Cupboard housing the solar panel system. Double glazed window to front aspect. Bathroom Smooth ceiling, inset mounted spotlights, tiled splashbacks, three piece matching suite comprising plastic panelled bath with shower off mixers, wash hand basin with vanity cupboards under, low level flush WC. Stainless steel heated towel rail. Bedroom Three/Office8'9" x 9'5" (2.67m x 2.87m). Plus built-in storage cupboard. Smooth ceiling, ceiling mounted light point, double glazed window to front aspect, double wall mounted radiator. Lounge15'10" x 16'11" (4.83m x 5.16m). Smooth ceiling, two ceiling mounted light points, double glazed window to front aspect, double glazed square bay window to rear. Two double wall mounted radiators. Second Floor Landing Smooth ceiling, ceiling mounted light point, double wall mounted radiator, doors to bedrooms one and two. En Suite Shower Room Smooth high ceiling, inset mounted spotlights, extractor fan, stainless steel towel rail, large fully shower cubicle, sink with vanity cupboard under, low level flush WC. Bedroom Two12'9" x 15'10" (3.89m x 4.83m). Smooth ceiling, ceiling mounted light point, loft access, inset mounted spotlights to dressing area. Double wall mounted radiator, door to overstairs storage cupboard. Outside To the rear there is a lovely decked area with raised flower beds, fencing surrounding, large storage shed and patio area to the left of the conservatory. Garage8' x 9'1" (2.44m x 2.77m). Smooth ceiling, ceiling mounted striplight, electric up and over door, space and plumbing for under counter washing machine, dryer and large standing fridge/freezer. Roll edged work surface, large wall and base unit. Property descriptions and related information displayed on this page, with the exclusion of Running Costs data, are marketing materials provided by Bradleys Estate Agents, Plymouth, and do not constitute property particulars. Please contact Bradleys Estate Agents, Plymouth for full details and further information. The Running Costs data displayed on this page are provided by PrimeLocation to give an indication of potential running costs based on various data sources. PrimeLocation does not warrant or accept any responsibility for the accuracy or completeness of the property descriptions, related information or Running Costs data provided here.